In the early 1950s, “Peter Arnold” ran one of Ajijic’s earliest advertising campaigns – to attract tourists or artists? One of my more maddening failures in trying to piece together the history of the artistic and literary community at Lake Chapala has been my inability to corroborate the existence of the “Peter Arnold Art Studios” in Ajijic in the early 1950s. The term appears in the obituary of author and serial adventurer Peter Elstob in The Independent (a now-defunct UK newspaper), written by his grandson, Ben West, but I have so far failed to find the exact same phrase used anywhere else. The Guardian obituary for Elstob refers to “Peter Arnold Studios”, omitting any mention of art. As we will see later, this may make more sense, though that writer’s claim that Peter Arnold began in 1951 is definitely false. Alex Bateman, in her valuable contribution to Ajijic: 500 years of adventurers (2011), also refers to “Peter Arnold Studios”. “Peter Arnold” was not a real person, but a business name used in Ajijic by Peter Elstob and his associate, Arnold “Bushy” Eiloart. In their various joint ventures, which lasted well into the 1970s, these two long-time friends got up to all manner of creative enterprises. This particular joint venture promoted Ajijic as an artistic vacation and retirement destination. Participants were housed in the Posada Ajijic and other rental properties as needed. Elstob lived in Ajijic from late 1949 to April 1952. Eiloart lived there from either late 1948, or early 1949 until April 1952. Both men (with Elstob accompanied by his future wife – artist Barbara Zacheisz – and their infant son) returned together to the U.K. from New York aboard the Queen Elizabeth, suggesting that this marked the end of their involvement in the “Peter Arnold” enterprise in Ajijic. Peter Elstob did not return to Ajijic for more than a decade. Eiloart may also have returned; he is recorded as traveling from New York to the U.K. in March 1955, though it is unclear whether or not he had revisited Mexico. Even after their departure from Mexico in 1952, the business name “Peter Arnold” continued to appear in adverts promoting Ajijic. Either Elstob and/or Eiloart continued to be partners in the enterprise, without taking any active role, or they passed the business on. The most likely recipient would be Bob Thayer, who took over as manager of Posada Ajijic, the small hotel where “Peter Arnold” had been based, at about the time they left. The earliest “Peter Arnold” ads appeared in 1949; I have also seen ads from publications in 1950, 1954 and 1956. I have yet to find any ads for “Peter Arnold” in non-U.S. publications. These adverts certainly attracted attention. Among those who saw this ad and decided to try his luck in Mexico was Jack Bateman who moved from New York to Ajijic with his wife Laura Woodruff Bateman and their three young children in 1952. The couple quickly became pillars of the local community, making exemplary contributions to the local social, cultural and artistic scene. Laura Bateman ran one of the village’s premier art galleries for many years in the late 1960s. 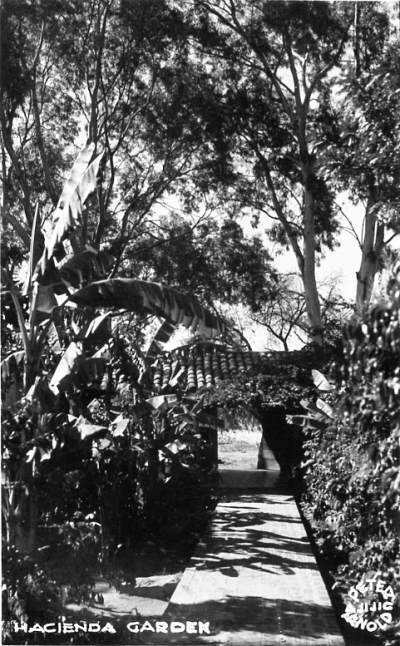 “Hacienda Garden”. This real photo postcard, with “Peter Arnold” logo, shows the Posada Ajijic gardens and was mailed in 1951. RETIRE ON $90 A MONTH or less in a resort area, 365 days of sun a year, dry temp. 65-85°. Or maintain lux. villa, servants, ALL expenses $l50-250 a mo. Am.-Eng. colony on lake 60 mi. long. 50 min. to city of 1/2 million, medical center. Schools, arts, sports. Few hours by air. Train, bus, PAVED roads all the way. Full-time servants, maids, cooks, $6 to $l5 a mo., filet mignon 35¢ lb., coffee 40¢, gas 15¢ gal. Gin, rum, brandy 65¢-85¢ fifth, whiskey $1.50 qt. Houses $lO mo. up. No fog, smog, confusion, jitters. Serene living among world’s most considerate people. For EXACTLY how Americans are living on $50—$90—$150—$250 a mo., Airmail $2.00 for 110 Pages current info., prices, roads, hotels, hunting, fishing and living conditions from Am. viewpoint (Personal check OK) to Peter Arnold, Box 12, Ajijic, Lake Chapala, Jal., Mexico. The ads appeared in a wide range of national and local newspapers. Several distinct P.O. Box numbers appear in these adverts. By using different boxes for responses from different newspapers or groups of papers, the advertiser could gauge the success of different media. Anyone responding to these adverts was sent an information booklet giving more details about Ajijic and the costs of living there. Interestingly, none of the adverts mentioning “Peter Arnold” (even in its earliest iteration in 1949) mention art workshops. The ads claim only that it is possible to live or vacation inexpensively in this Mexican village which has an art colony. The lack of any specific reference to art workshops suggests that this enterprise was a purely hotel management or real estate venture. The term “Peter Arnold Art Studios” used in Peter Elstob’s obituary in his native U.K. was perhaps a vanity expression, putting a bohemian spin on what seems to have been a straightforward capitalist enterprise embedded in tourism, not art. Despite its lack of any clear link to art workshops, this advertising campaign is worthy of further study. It is the earliest prolonged campaign I have found so far that aimed to persuade readers in the U.S. (and indeed elsewhere) that Ajijic was an attractive and inexpensive place to live. In succeeding years, many similar claims have been made. It was not to be many more years before the publication of the first book actively promoting Ajijic as the ideal place in which to live cheaply “in paradise”. How did Arnold Eiloart and Peter Elstob first hear about Ajijic? This is the big, as-yet-unanswered question. Perhaps Eiloart and Elstob first heard about Ajijic, and the attractions of living there, from the London theater circles in which they moved? In 1946, the two men teamed up with actor Alec Clunes to raise £20,000 for the lease on the Arts Theatre in London. After buying the lease there was only enough money for one production: Waiting for Lefty by Clifford Odets. Fortunately, this was a financial success, and enabled them to finance several other plays, including the first production of The Lady’s Not For Burning by Christopher Fry. The London theater and writing set at this time would have included friends of Nigel Millett and Peter Lilley who had teamed up as “Dane Chandos” to write Village in the Sun (first published in the U.K. in 1945), their month-by-month account of building a home in San Antonio Tlayacapan, just to the east of Ajijic. It seems perfectly possible that Eiloart and Elstob would have known this book. Millett lived in Ajijic from 1937 to his death in 1946. Prior to moving to Mexico, he had written (as “Richard Oke”) a biography, and several plays and novels, including Frolic wind (1929), a satirical gay comedy novel that was turned into a West End stage production in 1935. A revived run began on 10 November 1948 at Boltons Theatre, Kensington. Almost certainly, Eiloart and Elstob would have met Peter Lilley in Ajijic at some time, but it remains unclear whether or not they knew one another prior to the creation of “Peter Arnold”. Sincere thanks to Gail Eiloart for help in working out the timeline of her father’s visits to Ajijic. Anon. 2002. Peter Elstob. Obituary in The Telegraph, 31 July 2002. Josephine Pullein-Thompson, 2002. “Peter Elstob. Writer with a passion for adventure and a flair for entrepreneurship“, The Guardian, 25 July 2002. Ben West. “Obituary: Peter Elstob; Writer and Activist for International Pen”, The Independent (London, England), 9 August 2002.